Is there a way for people to live joyfully in communities? A skeptical yet curious investigative journalist named Juliet is sent on a mission from a magazine she writes for to get to profile a unique community in northern California. What she learns on this professional and personal journey opens her eyes and changes her life forever. Juliet, skeptical and bold, stumbles across more wisdom and truth than she’d bargained for. The Ananda community she explores is based on two principles: that personal change starts within and that our environment greatly influences our search for happiness. Putting a strong emphasis on meditation and introspection, Ananda communities have thrived for almost a half century―in India and Italy as well as California. Discover the magic and practicality of living in a harmonious spiritual community like Ananda, through interviews with actual residents about their life journeys, and a profound discussion with their visionary founder. 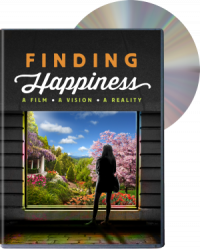 Go to our bookstore to watch the trailer or buy your copy of Finding Happiness for just $20! While you’re there, also check out Within Reach―the documentary of an amazing cross-country trek (on bicycles) looking for the perfect community! ← Eurotopia + A New We: Discover Europe’s Communities!